The Austrian period performer and ensemble leader, who died on March 5, aged 86, was one of the gentlest souls ever to achieve success in the combative art of classical music. A descendant of French Huguenots on one side and of Austrian emperors on the other, he experienced the Hitler hysteria in his hometown, Graz, and decided early on to beware of the dangers of charisma. Defying family expectations of a career in Church or the law, he studied music and played cello in the 1950s in the Vienna Symphony Orchestra, conducted at the time by Herbert von Karajan but also by such old-world types as Bruno Walter, Josef Krips and Otto Klemperer. A concern for art and heritage led him to rescue ancient instruments from Viennese junk-stores. He discovered they had to be played differently from the ones he used in the orchestra. His wife Alice shared his enthusiasm. Their friendship with the Gustav Leonhardts in Holland led to the formation of the Concentus Musicus Wien. Together, they recorded the complete Bach cantatas. 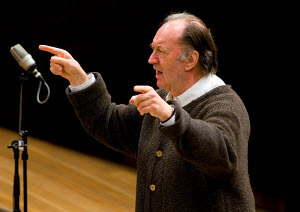 Harnoncourt was, in my acquaintance with him, a family-oriented, religious, tolerant, mildly spiritual man who struggled to understand why men – and musicians – could be so mean. He spent half an hour with me agonising over Karajan’s decision to shut him out of Salzburg for 20 years. ‘But we got on well in the orchestra,’ he sighed. Harnoncourt genuinely could not understand how a peacock conductor might take offence at his former cellist getting better Bach reviews than he did. Alice was always present. She protected him from much of the world’s nastiness and fought his corner with the music industry. At home, they made music with children and grandchildren. Some disputed his historical interpretations on record, others his stylistic decisions. But Harnoncourt’s informed approach to the Beethoven symphonies opened the ears and hearts of the Berlin Philharmonic and the Concertgebouw orchestras and his influence was felt everywhere in Europe. In the United States he had less impact, and was not much bothered by it, though he was touchingly proud of his cousin Anne d’Harnoncourt, director of the Philadelphia Museum of Art. I have seldom met a more benign musician. When we first met he pointed out a small anecdotal error in my book The Maestro Myth (which he devoured) completely without rancour. He responded to his own triumphs with humility and to indifference with a shrug. He laughed at the title ‘maestro’. In rehearsal, he was deadly serious, totally focussed, refusing to let go of a phrase until he was satisfied. He was a wonderfully decent human being. I never heard him utter a malicious word. He seemed to exist in a state of grace. Truly one of the greatest of all musicians, who never stopped thinking about, and then rethinking, music of all periods, on the way fearlessly challenging all preconceptions, always with the sole aim of returning music to the composer’s intentions, backed by formidable scholarship and utter musical integrity. That he did so with such formidable success for more than sixty years in the profession speaks volumes for this veritable titan of the musical world. Requiescat in pace. Thank you, Norman, for this appreciation. We shall not see his like again. Some of my fondest memories are having been his student in Salzburg and having participated in a few recordings, concerts and opera productions with the Concentus. As long as I am still here, I will carry those memories with me. No figure was more pivotal in post-1945 HIP than Harnoncourt (except possibly Gustav Leonhardt). Some of what he pioneered was already nascent (August Wenzinger had produced the first recording of the Brandenburgs on period instruments in the late-1940s/early-1950s), but it was Harnoncourt who spearheaded a performance revolution which was able to stand its own ground against what was more mainstream practice. Our understanding of Monteverdi, Purcell, Bach, Mozart – and then Beethoven, Schubert, Brahms, Johann Strauss II (in which he was incomparable) and others – have been massively enhanced by his work. But I like to think of Harnoncourt as a political figure too, in keeping with the wonderful appreciation above. He strove as far as possible to resist the autocratic model of charismatic authority on the part of the conductor, which had been epitomised by Furtwangler, Karajan, or for that matter Toscanini – and which would be continued by many, including some themselves involved in HIP. There is an integration of musicians in the work he conducted, and he demonstrated palpable alternatives to Wagnerian interpretations. Harnoncourt’s performances, as much as his writings, exemplify his resistance to a form of orchestral playing which is always smooth, the Melos taking precedence over all else, everything gauged so as to produce singular, overwhelming emotion. Instead he performed for intelligent and musically literate listeners, sensitive to so many possibilities of nuanced meaning, aware that music’s meaning does not stop when the audience begin to applaud. In some ways this has been seen as an aristocratic attitude, a throwback to a pre-bourgeois era, in particular before the French Revolution and the streamlining of professional musical training, separating out technique and a narrow conception of expression from a wider musical and other education, for which Harnoncourt blamed above all the formation of the Paris Conservatoire. And Harnoncourt’s aristocratic ancestry is sometimes cited in support of this view. But I see things differently. This was music-making to stimulate thought, open up the mind, a type of musical sortie within a culture industry which works to generate the opposite reaction. Harnoncourt was, as a musician, a democrat rather than an aristocrat, for he treated listeners with dignity and respect, rather than trying to play down to them. A wonderful tribute to “the Count”; thank you very much!! One of the most brilliant musicians of our era. Sad to see him leave us. But what he left us and the many musicians whom he inspired, will live well beyond his lifetime, and perhaps all of ours. A great man. One of his most outstanding acheivements, as part of a ‘Gesamtkunstwerk’, were his Monteverdi operas. This understanding and making available of the past is an utterly modern phenomenon, compensating for ideologies which want to do away with it. In fact, it is the only true modernity we have. I shall always cherish the Matthew Passions I sang for him in Vienna and Graz…his eyes drawing music from deep within all the musicians, and pin pointing yet another level of meaning with the slightest inflection of a word. Revelatory. May his influence continue to guide us. I’m terribly upset to learn this. It’s 4am in Sydney and I’ve just learned this awful news, and he only retired in December. I’ve seen Harnoncourt and Concentus so many times in Vienna and always enjoyed his animated pre-concert addresses from the podium. I didn’t understand everything because of my nascent German, but I remember the audiences laughing warmly!! And his performances at Theater an der Wien and that of Concentus and Arnold Schoenberg Choir showed me how hard musicians work when conducting opera! I’ve read his books and love his music. As it happens, I’m presenting a 2 hour lecture in May about Harnoncourt for Music Appreciation for retirees; that can be my tribute, which was planned as he announced his retirement. Let’s not forget Alice, his surviving wife. Vale Nicholas Harnoncourt. A wonderful life, well lived. Woops, I’ve noticed a few spelling mistakes on his first name and now made one of my own..Nikolaus, of course!! And the Harnoncourts lost a son in a road accident in 1990, so they didn’t have a charmed life but one dedicated to music and work. Oh, he’s going to be so sorely missed – particularly in Austria. I had the chance to watch him several years ago conduct the Concentus Musicus in several Haydn symphonies. I’m not enough of a period-Haydn buff to call it a revelatory experience, but what I really enjoyed was how the Musikverein almost seemed like his living room. As for not performing much in the United States, a New York Times article a few years ago had him saying that he just didn’t fly well. If he were to work with a US orchestra, he’d want to work with them regularly, and the travel would be too much of a strain. Let us not forget his two (?) appearances as conductor at the VPO New Years Day concerts. He seemed to really enjoy himself. My only experience seeing NH live was a concert he gave in Carnegie Hall with the VPO. It was an all Dvorak program and as an encore he offered several of the Slavonic Dances. but before he began and before announcing what the encore was to be he turned to the audience and said that this was for the Bohemian grandmothers that we all really have. That said it all. Just as for many of those commenting here, Nikolaus Harnoncourt holds a special place for me — certainly for his extraordinary interpretations that always seemed to try to find something new and intelligent to say. But I shall always cherish the moments that I spent with my toddler son, playing with him in his room while listening to Harnoncourt’s wonderful Beethoven symphonies. One of my son’s first words was “Harnoncourt”, and I was (and still am) a very happy father. Thank you for your endearing and heartfelt piece, Mr. Lebrecht. Harnoncourt has left us a lot and will continue to inspire, and that’s enough for a lifetime. Thank you for this, Norman, and for your kind and insightful portrayal of the man. May his memory be for a blessing – et lux perpetua…. I have many of his wonderful recordings – just listening now to perhaps my favourite: the Mozart piano concerto 23, K488 with Friedrich Gulda and the Concertgebouw. Timely listening, too, Alex. I think it’s about this time (early March, ie, 2nd/3rd, in 1786), when Mozart completed this beautiful concerto. The saddest thing about dying is that one never knows how much one was appreciated until it is too late. He created the amazing-sounding Concentus Musicus Wien, no other period ensemble has a sound so rich and distinctive, showcasing Tyrolese original instruments and not modern copies. Plus, his conducting was expressive, i.e. truly musical, with a trademark phrasing; this also contributed to make his recordings stand out. Afortunadamente nos quedan sus grabaciones, con las que seguir enlazando con su espíritu artístico y creador. Su música nunca fue rutinaria. 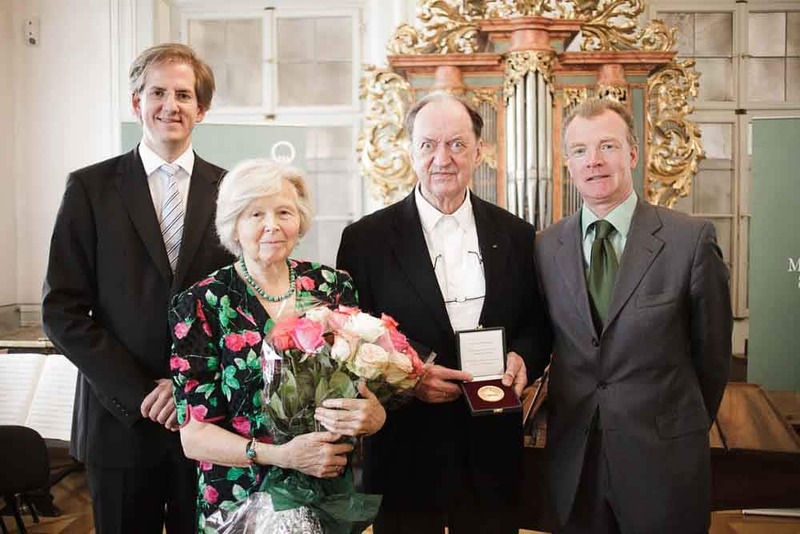 Nikolaus Harnoncourt died on March 5, 2016. Even though he announced his retirement on Dec 6, 2015 (on his birthday) due to illness, his death was a monumental shock to all those whose life he transformed, including mine. I remember discovering Nikolaus Harnoncourt around 1990. I was 12 or 13 and his Mozart recordings turned my entire way of thinking, my entire vision of life (and death) upside down. I had never experienced such a life changing experience and I would never be the same. Since that initial shock, Harnoncourt took me through a truly unique journey that went, inter alia, from Monteverdi, Bach, Haydn and Mozart to Beethoven, Schubert, Brahms, Schumann, Dvorak, Bruckner, Smetana and Gershwin. His music making went far beyond music. It put a mirror in front of my soul and made me feel ALIVE by confronting me to the tragedy of life. I will never be grateful enough to Harnoncourt for having given so much meaning to my life and for having given me the gift of passion. He may finally ask Bach and Mozart about his endless quest for the truth. And make Heaven an even more beautiful place. Thank you Maestro. I will be forever grateful for your gift and I shall pass it along to my children so that it survives through the ages. I have just heard this sad news, Nikolaus inspired me more than any other musician during the 80s and 90s. He had a scholarly approach to his work, but as a performer he took risks and chances. His work was always thought provoking and all too often it forced me to invest in urtexts and facsimiles to look for clues that I might have missed. I am glad that he changed his mind in later life and expanded his repertoire into later composers; we are the richer for it. I first saw/listen to his music on youtube which was Mozart symphony #41 played by Wiener Phil in Japan. I was struck by his facial expression and impressed by esp the 1st movt. Later I bought complete Beethoven symphonies set on Amazon and it became my most favorite Beethoven symphonies set. I play trumpet in amateur orchestras, and play Beethoven quite often and I always come back to Harnoncourt’s recording for reference.